One example of a recent Simons-Voss product development is the Smart Handle 3062, a digital door fitting that combines intelligent access control with elegant and ergonomic design. Behind its slim, flat exterior lies highly innovative technology. Proving that you don’t need to compromise on style when installing access control systems into your property or premises. How Do Simons Voss Access Control Systems Work? In developing the new SmartHandle 3062 Simons Voss focussed in particular on the requirements for use in the Education, Healthcare and Residential sectors. 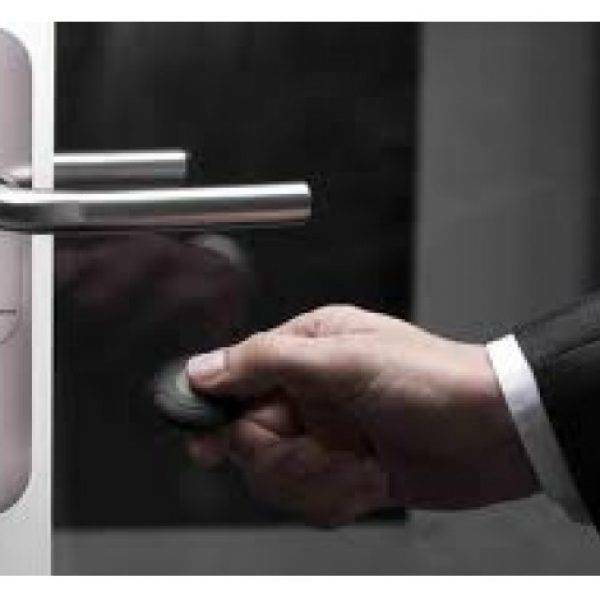 In the Digital Locking and Access Control System 3060, the SmartHandle 3062 communicates contactlessly with the identification media and controls where and when up to 64,000 users are granted access. It can also be operated online with direct networking or integrated in a G2-based virtual SimonsVoss network. The battery change intervals of up to 10 years also set new standards. The unique highlight of the digital door fitting 3062 is that it can be mounted quickly and easily without the need to drill holes through the door. The assembly process (based on this SnapIn principle, for which a patent has been applied for) basically involves fastening the fitting with just one screw, This procedure ensures that the fitting is permanently secure. Because no wiring or holes are required, the doors remain undamaged. We have a dedicated team who are on hand to give you any advice you may need about access control systems, so why not contact us today! Alternatively browse our Simons Voss products below.